Instructors Sean Edwards (left) and Matt Shackleton in the fabrication and welding workshop at HETA’s new headquarters in Hull. Two colleagues who traded expertise in a remarkable reversal of roles are urging others to make the move from industry to instructing and train the engineers of the future. 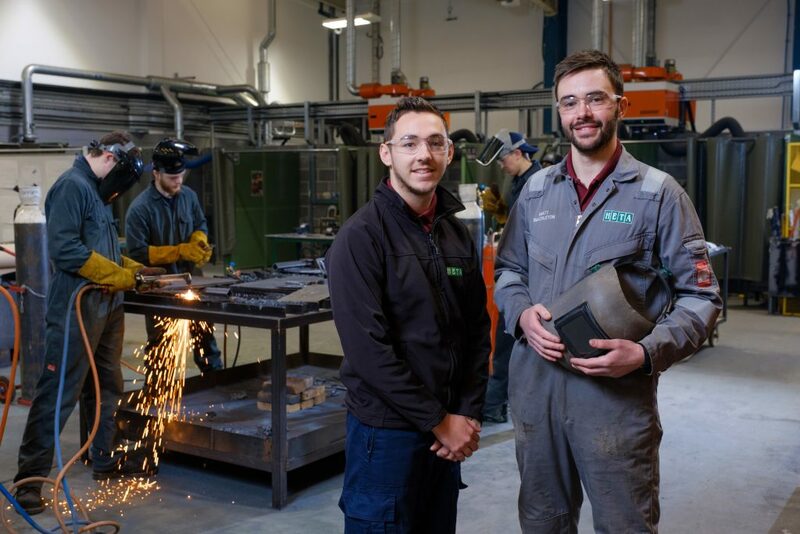 As a workshop supervisor at Daifuku Logan in Hull, Matt Shackleton relished the task of passing on his skills to apprentices including Sean Edwards, who at the time was a young learner from Humberside Engineering Training Association. But Matt’s long-term aim was to join the team at HETA, and when Sean got there first, he remembered his former instructor and gave him the advice to help him make the move. Matt is older by six years, but it was Sean who took the training route first after his potential was spotted by Sarah Smith, HETA’s former workshop manager in Hull, as he completed his apprenticeship and a BSc in engineering management. It was only a matter of time before Matt took the next step, and he found Sean a willing source of encouragement. Cathy Bourne, HR Manager at HETA, is now looking for other engineers to shadow the teaching staff with a view to making the switch. Cathy said: “We are always looking for skilled engineers who want to become teachers and there is no one better to advise them than the instructors we have here who have come from industry. Lee Sutton, an electrical instructor, joined the ranks at HETA after spending nine years on domestic, commercial and industrial work with accompany in Hull and then four years on fitting and maintenance at a shipyard. The new Hull training centre which HETA opened in August 2018 houses a working environment which is a big improvement on the previous workshops at Sutton Field industrial estate. Matt said: “We have the space and the facilities to fabricate a lot more things and create more real-world scenarios. It’s very similar to being in a company and I would recommend it to others in industry. The transition to education is a big one but there are a lot of people who can help. Be the first to comment on "Instructors make the move from industry to train engineers of the future"